Physic Material을 사용하여 충돌하는 오브젝트의 마찰이나 반사 효과를 조정할 수 있습니다. Note that for historical reasons, the component is named “Physic Material” rather than “Physics Material” and the use of the unusual name is therefore intentional. The equivalent component for 2D is, however, named more logically as “Physics Material 2D”. Physics Material을 만들려면 메뉴 바에서 Assets > Create > Physic Material를 선택합니다. 다음 씬에서 Collider에 프로젝트 뷰로부터 Physics Material을 드래그합니다. Dynamic Friction 이미 이동중인 경우에 사용되는 마찰. 일반적으로 0에서 1 사이의 값을 사용합니다. 0이면 얼음 같은 느낌이 됩니다. 1인 경우, 많은 힘 또는 중력이 오브젝트를 누르지 않는 한 매우 빠르게 정지합니다. Static Friction 오브젝트가 평면상에서 정지되어 있는 경우에 사용되는 마찰. 일반적으로 0에서 1 사이의 값을 사용합니다. 0이면 얼음 같은 느낌이 됩니다. 1인 경우, 오브젝트를 매우 강하게 움직이려고 합니다. Bounciness 표면이 반동하는 방법을 나타냅니다. 값을 0으로 설정하면, 반동을 하지 않습니다. 값을 1로 설정하면, 에너지의 손실없이 반동하게 됩니다. 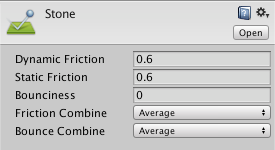 Friction Combine 두 개의 충돌하는 오브젝트의 마찰이 어떻게 결합되는가. - Average 두 개의 마찰 값이 평균화됩니다. - Minimum 두 개의 마찰 값 중 작은 값이 사용됩니다. - Maximum 두 개의 마찰 값 중 큰 값이 사용됩니다. - Multiply 두 개의 마찰 값이 서로 곱셈됩니다. Bounce Combine 두 개의 충돌하는 오브젝트의 반사 정도가 어떻게 결합되는가. Friction Combine Mode와 동일합니다. 마찰면이 서로 분리되는 것을 방해하는 값입니다. 이 값은 오브젝트가 쌓일 때 중요합니다. 마찰에는 동적 및 정적의 두 종류가 있습니다. Static friction은 오브젝트가 정지하고 있는 경우에 사용됩니다. 이것은 오브젝트가 움직이기 시작하는 것을 방해합니다. 강한 힘이 가해지면 오브젝트가 움직이기 시작합니다. 움직이기 시작하면 Dynamic Friction이 작용하기 시작합니다. 오브젝트가 다른 오브젝트와 접촉 중에, Dynamic Friction은 오브젝트를 감속시키려고 합니다. When two bodies are in contact, bounciness and friction modes are applied individually to each agent. So, when body A has a friction combine mode of Average and body B has mode Multiply, then A is going to behave according to average parameters and B according to multiplied parameters. Please note that the friction model used by the Nvidia PhysX engine is tuned for performance and stability of simulation, and does not necessarily present a close approximation of real-world physics. In particular, contact surfaces which are larger than a single point (such as two boxes resting on each other) will be calculated as having two contact points, and will have friction forces twice as big as they would in real world physics. You may want to multiply your friction coefficients by 0.5 to get more realistic results in such a case.